opened in July 2013, together with a few major occasions that we recall from before then. 12th April 2019: A new event for the Tingewick and Water Stratford Horticultural Society was held at Tingewick Village Hall. The event began with Elaine giving a demonstration in the art of making a wreath for Easter, with both flowers and foliage, and also demonstrating a table decoration, which could include candles. Easter bunnies, chicks, and a variety of other Easter decorations could be added too. The seventeen ladies that took part, then chose to make one or the other. The end result was amazing. Wine and nibbles were available as was the usual raffle. A number of really lovely comments were made about the event by the ladies that attended, so it is hoped that this event will become a permanent feature in our calendar. opportunity to taste a total of eight wines, a mixture of sparkling, red, white and sweet, from various regions of France. Local wine expert Ron Gleeson described the characteristics of each wine and kept everyone entertained with humorous anecdotes. Each wine was accompanied by a carefully selected hard or soft French cheese with the final sweet wine accompanied by a delicious assortment of mouthwatering French desserts. A raffle at the end of the evening meant six lucky people were able to take home a bottle of wine to enjoy at their leisure. December 2018: There were no less than four Christmas services in eleven days in the village this year. On the 15th a benefice 'Starlight Nativity' was held at Rectory Farm. The torrential rain failed to spoil the occasion, with the planned journey through the farm being replaced by a magical service in the lambing barn which the sheep seemed to enjoy almost as much as the humans. The Young Farmers came next, holding their Carol Service in St Giles on the 19th. The village Carol Service took place on the evening of the 23rd, with traditional carols and readings being followed by almost equally traditional mince pies and mulled wine, not to mention some delicious chocolates. Finally children formed over a quarter of the congregation for our Christmas morning service during which they carried the nativity figures to the crib and stood around it to sing 'Away in a manger'. Our thanks to Revd Liz and all who contributed to the services throughout the year. 11th November 2018: A large number of parishioners came together on Remembrance Sunday to mark the Centenary of the Armistice. During a respectful service, we were taken back to the Great War through the words of two poets killed in that conflict. We then heard a moving poem dedicated to one of our war-dead by his great-nephew, reflecting on their shared experience of farming and on a visit to his grave in Flanders. hanging baskets, pots filled with a variety of flowers and foliage as well as lovely scented roses. Those who like to grow their own displayed all sorts of vegetables and fruits from marrows, onions and beetroot to tomatoes, medlars and raspberries. Many exhibitors showed their artistic side with beautiful floral arrangements and nearly a hundred photographs were on display. Bakers made delicious cakes, jams and chutneys whilst those who enjoy handicrafts showed off their varied skills by making Christmas decorations, cushions, table runners and so much more. Children at the three local schools made over ninety drawings, paintings and collages of yellow and orange flowers. All in all a very colourful display. After admiring the exhibits visitors perused the stalls, entered the raffle, had a go on the tombola and finished off the afternoon with tea or coffee and delicious homemade cakes. The afternoon ended with the presentation of Cups and Best Exhibit Certificates by the President, Richard Fenemore, to the worthy winners. Many thanks to everyone for all their help and support and to all those who came to look around the Show in the afternoon. It is much appreciated. 15th July 2018: We held our first Lammas Bread and Beer service and thus completed our goal of celebrating all four of the church's rural festivals. On another beautiful summer's day we reflected on the central place that bread takes in Christian teaching and sampled three different loaves (one home-baked by the Rector) and two different beers. December 2017: The festive season at St Giles started early this year with the Benefice Choir singing Songs for Advent on the first Sunday of the month. A few days later we were pleased to effect a long overdue reunion. A gravestone must have fallen many years ago and moved to lean against the wall of the tower. Close inspection revealed it to be that of Ann Morris, who lived at Town Farm and died in 1837 aged 91. We managed to 'walk' it to the south side of the church with the intention of placing it on the grave of her husband John, who farmed here until his death in 1821. But we then discovered that next to John's grave there was a footstone that had no corresponding headstone, so we were able to lay the heavy stone on what we are sure is Ann's own grave. On the third Sunday we enjoyed a traditional service of readings and carols, followed by mulled wine and delicious mince pies made by two of the youngest members of the congregation, while on Christmas Day there was a full church (over 60 people) for the Benefice Christmas Communion service. demonstrated how to produce both items starting with various types of greenery and then adding further colour and structure with the use of candles, bows, berries, cones, dried fruits and other decorations. Everyone then had the opportunity to make their own wreath or table decoration with advice where needed from Elaine resulting in some beautiful and colourful creations. With Christmas carols and songs playing in the background, mulled wine and mince pies on offer and the chance to win various raffle prizes it was a very enjoyable start to the festive season. 13th July 2017: We learned of the death of John Seaton, aged 86. With his death following that of Helen Hilsdon, our church has lost its two greatest friends in living memory. They were churchwardens together for many years but their contributions touched every part of village life. After he left the village John could be found devoting the same care to Barton Hartshorn churchyard as he had devoted to ours for so long. Thank you, John. of hawkbit or hawkweed and one of its folk names is Fox-and-Cubs, though a vixen would be unlikely to achieve quite such a vivid orange. Chris knows it by the extraordinary name of Grim-the-Collier! The black hairs on the plant were thought to resemble coal dust on a beard of a miner or coalman and there was a play of 1662 called Grim the Collier of Croydon about a despised character in folklore, a grimy coal merchant who sold substandard or short-weight fuel. Other names include Devil’s Paintbrush, Orange Hawkbit and Tawny Hawkbit. It is hard to imagine such a lovely flower being described as a 'pernicious weed' but in some parts of Australasia and North America it's regarded as a serious problem, smothering other plants and tainting the hay. 16th/18th June 2017: We celebrated the memory of Jo Cox MP in fine style, with a Great Get-Together on the Friday evening and Pimms and Hymns in the churchyard on Sunday. Around forty people, more than half the village, gathered in Gerard and Leah's garden for drinks and nibbles on a perfect summer's evening. Planning a service in the churchyard 'weather permitting' usually means worrying about rain but in the event it was sunstroke we had to worry about. Fortunately all seventeen adults and four children lasted out the service, the text of which is shown here. The readings celebrated midsummer, while the prayers focused on Jo's inspiration, recent tragedies in London and Manchester, and community spirit. Thanks to all involved in putting on these events, especially Guy and Catriona who were responsible for much of the catering at both. 21st May 2017: Fourteen adults, three children and six dogs accompanied the Rector on our annual Rogation walk. The service did not have an auspicious start when we discovered the church had no electricity but a quick trip home by Liz for her guitar saved the day. Our walk was less demanding than in some years - even the septuagenarian managed it without difficulty - but gave us a chance to appreciate the new steps onto the railway embankment and enjoy the greatly improved walk along it to the river. The sun shone on our endeavours and we were rewarded with drinks in the Rectory garden afterwards, thanks to Sarah and Chris. 4th May 2017: Many years of village history disappeared when BT removed our only public telephone box. 9th April 2017: The churchyard is always a magical place in spring, with aconites and snowdrops being succeeded by hosts of wild daffodils, then primroses, bluebells and celandines. This year the primroses are sensational. This spring has also seen two surprise ornithological appearances in the parish, a raven and an egret. 26th March 2017: The number of children in the village has started to revive after a long decline and we were pleased that several of them played a part in our well-attended Mothering Sunday service, the text of which can be found here. Sarah had made beautiful posies for all the mothers present and Mike gave a talk on one particular Water Stratford mother, Ethel Frances West (née Goddard). 17th March 2017: The Old School once again became the Water Stratford Arms, but this time with an Irish accent to befit St Patrick's Day. 18th/25th December 2016: Christmas 2016 was well celebrated at St Giles: both the Carol Service on the preceding Sunday evening and the Christmas morning service were well attended, enabling good singing and a festive atmosphere. The Carol Service was as usual a happy village get-together, extended by refreshments afterwards, while on Christmas Day we were delighted to welcome numerous visitors to swell our congregation. People gave generously to the Christmas collections, as a result of which a donation was sent to Crisis at Christmas, the remainder being needed to keep the church running. 13th November 2016: Our Remembrance Service drew a record congregation for recent years, with twenty-one adults and five children. After the traditional Act of Remembrance for the six men on our war memorial, we heard readings about the Battle of Jutland and the Battle of the Somme. In our prayers we particularly remembered the people of Aleppo and Mosul. The text of the service is shown here. 16th October 2016: This year's harvest thanksgiving was notable for being the first occasion that our 'new' organ was played in a service, thanks to Sara. Sixteen adults and four children heard a sermon and prayers based on the rainbow accompanied by Revd Liz's impressive visual aids. 18th September 2016: Our service of Holy Communion saw several innovations. It commenced with two dedications: a replacement organ (the previous one had been making very odd noises) and a harvest-themed quilted panel above it. The organ was kindly given by Lenborough benefice (it had languished in Hillesden church for many years) and the panel was made and donated by someone who lived here as a child and whose grandmother used to be our organist and churchwarden. Then our final hymn was the first performance here of the hymn to St Giles written by Sara in 2014. 19th June 2016: Our June service always coincides with Fathers Day and is close to Midsummer Day so this year we held a Pimms and Hymns service in the churchyard. We sang five hymns, heard several poems and psalms, and gave thanks for the natural world and the joys of summer. The Pimms tasted all the better for the sun which just about kept shining until the end. 20th May 2016: The Old School became the Water Stratford Arms for the evening, with around forty people, half the village, coming together to drink and chat. Despite it being billed as a drop-in event, many stayed until 'closing time', showing our community's enthusiasm for meeting their neighbours - and for alcohol! 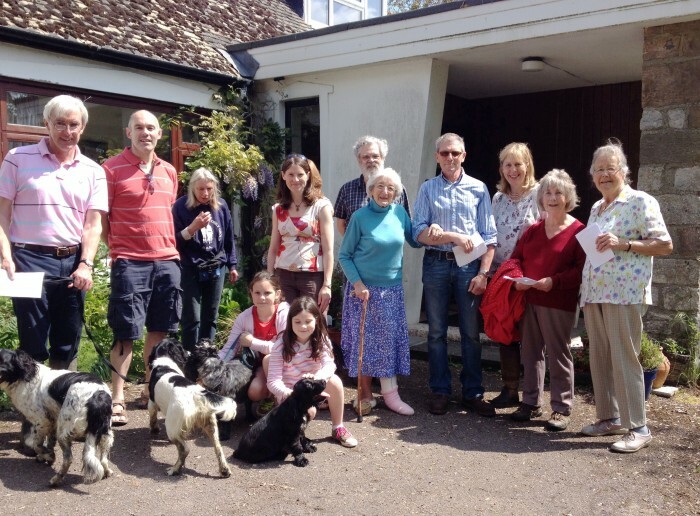 15th May 2016: Our annual Rogation walk drew thirteen adults, four children and four dogs. In addition to hymns, bible readings and prayers, we heard poems by Alice Crosland, Thomas Hardy and W H Davies. Chris planned and led the service and read his newly-written poem The Rectory Oak next to that magnificent tree, which is at least 435 years old. 24th April 2016: Congratulations to Guy, our churchwarden, who ran his first London Marathon in 4 hours 17 minutes. He ran in aid of The Puzzle Centre, a local pre-school for children with autism. 17th March 2016: We learned of the death of Paul Daniels, magician and quiz-show host, who owned a house here in the 1970s and 80s. He opened our village fete in 1984 and judged its children's fancy-dress competition. 8th November 2015: At this year’s Remembrance service (the full text of the service is shown here) we marked several anniversaries. It is one hundred years since the deaths of Herbert George Cadd, the first to die of the men listed on our war memorial, and the poet Rupert Brooke. We heard Bert Cadd’s life-story and Brooke’s famous poem, The Soldier. The 75th anniversary of the Battle of Britain was marked with a poem by John Gillespie Magee, a pilot who died in 1941 aged 19. He had been inspired by Brooke and won a poetry prize at Rugby School that had been won by Brooke 34 years previously. A reading about Sir Nicholas Winton, one of the first pupils at Stowe School, reminded us of the 70th anniversary of the liberation of the concentration camps, and finally we marked the 70th anniversary of the end of the Second World War. A visitor to last year’s Remembrance Service brought with her service sheets used to celebrate this in 1945, both the official national service and the adaptation used at St Giles. They are fascinating records of the mood at the time and copies of these were available to look at. 20th September 2015: Tingewick & Water Stratford Horticultural Society members and friends paid a very interesting afternoon visit to Upton House and Gardens near Banbury. To coincide with the 70th Anniversary of VE Day, rooms at Upton House this summer have been set up as they were during the second World War. The owners of Upton House, the Bearsted family, moved out of their country retreat and the family’s merchant bank M. Samuel & Co. moved in for the duration to protect staff and assets from the threat of air raids in London. Rooms are filled with desks, old style typewriters, telephones and other office equipment used by staff at that time. Gas masks and information on how to use them, plus other wartime notices can be seen. Examples of wartime wedding dresses are on display together with simple ideas on how to make everyday dresses more attractive. Photographs, letters, uniforms and personal mementoes add to the story. Outside is a wartime mobile cinema tent and Anderson Shelter. Visitors can also learn about the war work of Lord and Lady Bearsted. Lord Bearsted’s bank funded all manner of Government projects and Lady Bearsted helped run and finance mobile canteens in the East End of London. Further information explained how valuable paintings from the house were hidden away in a Welsh slate quarry for safe keeping. and an enjoyable time appeared to be had by all. 15th March 2015: A rarity in recent years saw two services at St Giles on the same day: the first attended by our youngest village resident at under one year old and the second by our oldest at over ninety. Villagers and friends gathered in the morning to give thanks for mothering and to hold before God its joys and sorrows. Pictures remain in the mind: children and adults in the chancel making posies as the congregation arrived; a two-year-old purposefully walking from front to back of the church clutching a posy to give his mummy; candles flickering after the service in memory of mothers no longer with us but whose love and influence live on. In the evening we welcomed visitors from across the deanery and beyond, for a Lent Evensong focussing on St Aidan of Lindisfarne. The benefice choir sang an introit and anthem and led the congregation in singing canticles, responses, psalm and rousing hymns. After both services people lingered to enjoy refreshments and each other's company. 18th January 2015: Motorists driving through Water Stratford may have been surprised to see our robed Rector and her congregation standing at the edge of the churchyard admiring a teleporter, there to be blessed as a representative of all ploughs and farm machinery. Back in church, a bowl of soil was also blessed, as we thought of earth's power to nurture new growth and prayed for a good outcome for the labour of farmers, gardeners and all who work the land. These were part of our Plough Sunday celebration. 21st December 2014: Usually only the Rogation service takes the church around the village but this year we attempted the same with the Carol service. New nativity figures were purchased and distributed to various houses in advance. We started the service at the top of the village and walked down to the church, collecting figures and singing carols en route. On arrival in church the figures were placed in the crib and, after a final carol, we enjoyed mulled wine and mince pies. Remembrance six crosses were 'planted' in front of the altar by the two youngest members of the congregation. The text of the service can be found here. We have a long tradition of using secular poetry and prose in our services and this year included possibly our longest poetic extract so far. John Masefield's August 1914 expresses so well the impact of the war on the young men of a rural community like ours, most of them agricultural workers who had scarcely left the county before. 13th September 2014: The Parish Meeting committee organised a Treasure Hunt and Hog Roast to raise funds for The Old School, which serves as a village hall. Teams followed clues in the form of rhyming couplets which led them to the locations of fifteen questions about the village and its surroundings. The clues and questions were designed to make people look at places and objects that they may not have studied in detail before. After the marking and debriefing, prizes were awarded to the two top teams, and the raffle was drawn. More people arrived for the excellent hog roast and puddings, and the whole event raised over £400. colour scheme and individual lighting. Seventy guests enjoyed a four course meal, drinks and music from the Gershwin Gang. Guests entered into the spirit of the evening with many ladies dressed as Flappers and gentlemen dressed as Gangsters. Barbara Prideaux, Chairman, thanked everyone for their support over many years and Will Litt, Vice President, proposed a toast to the continued success of the society. A celebration cake was cut and some superb raffle prizes kindly donated by local businesses were on offer. After the formalities music and dancing continued until midnight. The evening was considered a great success and a wonderful way to celebrate this special anniversary. vegetables and the handicraft, domestic and photographic classes were very well supported this year. 29th September 2013: Wheat sheaves and Michaelmas daisies in the chancel; fruits, seed-heads and colourful Autumn flowers in the nave: Harvest was rightly celebrated in a thankful service at St Giles Church. Members of the congregation presented symbolic gifts at the altar: soil, fruits, seeds, water, bread and wine. The talk, and a selection of short Bible passages incorporated within it, made us think about a bountiful Creator, and how we should respond with generosity towards others. 20th September 2013: The Parish Meeting Committee organised a Quiz Night in the Old School. Nine rounds of questions were tackled by six teams of up to six members whose ages ranged from under 10 to over 90. In the 'Name that tune' round, those who recognised Chattanooga Choo Choo were very glad of the young people's help with Lady Gaga! An excellent fish and chip supper was delivered halfway through, and much of the liquid refreshment was financed by the remains of the village Diamond Jubilee funds. The scores were very close, with a tie-break needed to establish the winners. Well done to the organisers, and to Terry and Carol for running the quiz with humour and efficiency and setting questions that were so well suited to those present. 24th August 2013: Tingewick & Water Stratford Horticultural Society held its 89th Annual Summer Show. With over 30 exhibitors, some showing for the first time, visitors to the Show were able to view over 350 exhibits in the various adult classes plus 40 junior exhibits. There were some impressive displays of flowers particularly in the dahlia classes and the entries in the vegetable classes proved exhibitors really did know their onions. Mouthwatering cakes, quiches, jams and chutneys were entered in the domestic classes whilst the handicraft section allowed exhibitors to show off their skills in patchwork, knitting, crochet and jewellery design. 16th September 2012: In the Village Duck Race, hundreds of yellow plastic ducks braved the waters of the Great Ouse. There were also children's sports and a tug-of-war across the river. This event has taken place for many years. 5th October 2009: The church was closed for re-roofing and restoration. Services took place in the Old School and the church reopened with the Carol Service on 20th December 2009. Our Carols were accompanied by a wind band comprising the Rector and five villagers. 7th June 2008: The Bishop of Buckingham dedicated a memorial to John Mason on the west wall of the church. About seventy people attended the Commemoration Service, in which they sang three of Mason's hymns and listened to historical information about Mason's life and work and an interesting sermon from Bishop Alan. 3rd June 2002: We celebrated the Queen's Golden Jubilee with a street party.